Let’s say you want to build the next Startup Dope. Technically speaking, there would be two areas you’d work on: the client facing front-end which deals with content presentation, interaction and relaying user specific information to the server facing back-end where all the data (user accounts, articles, comments…) and its related logic (user account already exists, recommended articles, commenting requires account…) resides. That’s your Web Development 101 right there! Moving on, each of these ‘ends’ have its own set of tools and frameworks to aid development. The final code is packaged together and deployed or hosted on a server that takes up its back-end duties and pushes the front-end data to anyone that knows its address — www.NextStartupDope.com for example! You can test your site locally but for the world to see your work, you have to pay up. First, for getting an address (domain name) and then to find your code a home (hosting server). Or you can use Divshot! 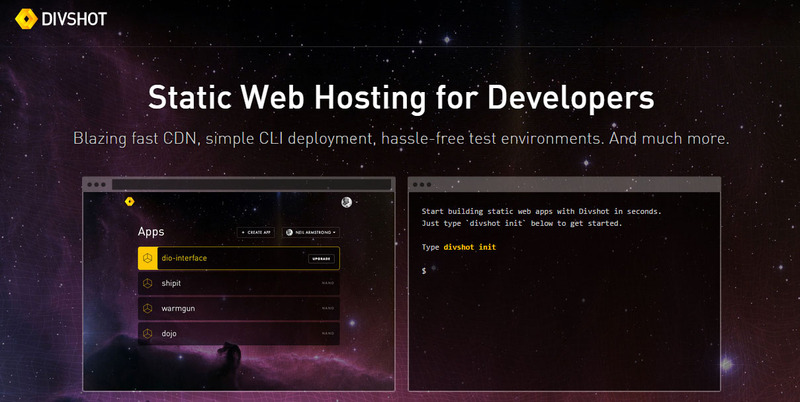 It is a front-end hosting service as well visual bootstrap builder that is going up against the likes of Heroku and Amazon Web Services (AWS). How does it compare? Read on! With Divshot, you can deploy your project to a fast CDN in a matter of seconds. No configuration necessary. The service is technically well equipped to offer a very compelling alternative to the established players and the addition of a WYSIWYG Bootstrap-infused website builder with production ready code generation gives it leg-up. You can get started for free with access to 100MB of storage and support for custom domains for a single app. Other plans with more features are offered on a monthly subscription basis. Bhoopati is a Staff reporter @Startup Dope. He loves writing about cutting edge Technology and Startup Stories. Kindred.ly Wants to Hook People Up through Photos! Boonle Gives Freelancing a Modern Age Twist!